John Travolta's 16-year-old son, Jett, who suffered from uncontrolled seizures, died suddenly on Jan. 2, 2009, while on vacation with his family in the Bahamas. After an autopsy, “seizure” was listed as the cause of death. Later that year, in another heart-wrenching case, Steve Wulchin went to wake his 19-year-old son, Eric, and found him lying on the floor of their home in Boulder, CO. Eric, whose last seizure was six months before, had died unexpectedly during the night. Free AccessAuthor InformationFrom 1993 to 1995, Shanna McCoy served on the Governor's Developmental Disability Planning Council for Arkansas, and is still a member of the Arkansas Disability Coalition. My mother was the kind of woman you didn't want to say no to. When a pediatrician told her that I would never read, walk, or talk, my mother responded, “My daughter will be walking by the time I'm through.” It took me a long time to even sit up and stand on my own, but two and half years later, my mother was right. I was able to walk. At the age of 18 months I was diagnosed with cerebral palsy. The cause: severe brain trauma from a forceps injury during birth. No one volunteered this information; a receptionist accidentally left my medical records on the desk and my mother decided to look through them. But I never really accepted the fact that I was “Disabled” with a capital “D.” As a child, I convinced myself that I was an ordinary girl who possessed some extraordinary gifts. El catedrático de Fisiología Humana de la Universidad de Santiago Jesús Devesa Múgica ha defendido este viernes en Salamanca el tratamiento con hormonas de crecimiento y melatonina unido a prácticas de fisioterapia, logopedia y terapia ocupacional para mejorar la calidad de vida de los personas con daño cerebral. Así lo ha señalado en una rueda de prensa previa a su intervención en la Universidad de Salamanca (USAL), en la que ha explicado su Proyecto FOLTRA, Fe, Optimismo, Lucha y Trabajo, encaminado a la ayuda para la rehabilitación física e intelectual del paciente neurológico, con daño cerebral o periférico, congénito o adquirido. Devesa Múgica ha sostenido que inició del programa debido a "la necesidad", tras su sufrir su hijo mayor un grave accidente de tráfico. A él le aplicó "de forma empírica" todo lo que le había reportado la investigación realizada durante más de treinta años en hormona del crecimiento. A Primeira Dama visitou ontem a AFID e na reportagem fez questão de referir a importância da Intervenção Precoce. O Q. deu o ar da sua graça e até lhe disse o seu famoso e alegre "buuuu". É com satisfação que fazemos parte deste projecto. Jesús, anteayer vi por segunda vez a 4 niños de Foltra. Sus avances han sido espectaculares, especialmente el que peor estaba, I.D, ha pasado de venir totalmente rígido y desconectado a venir abrazado a su madre, sonriendo y "alucinado con la nevera y el horno". También los demás han mejorado muchísimo. Estoy encantada de participar en este proyecto. Mil gracias. At ages 1 and 1-1/2, children who get most of their sleep at night (as opposed to during the day) do better in a variety of skill areas than children who don't sleep as much at night. That's the finding of a new longitudinal study conducted by researchers at the University of Montreal and the University of Minnesota. The research appears in the November/December 2010 issue of the journal Child Development. The study, of 60 Canadian children at ages 1, 1-1/2, and 2, looked at the effects of infants' sleep on executive functioning. Among children, executive functioning includes the ability to control impulses, remember things, and show mental flexibility. Executive functioning develops rapidly between ages 1 and 6, but little is known about why certain children are better than others at acquiring these skills. New research provides fascinating insight into mechanisms that underlie recovery after damage to a region of the brain important for memory and attention. The research, published by Cell Press in the November 4th issue of the journal Neuron, highlights the role of undamaged portions of the brain that can "take over" and support the recovery of function. Brain damage can have devastating consequences, depending on the location and severity of the injury. Damage to an area of the brain called the prefrontal cortex often results in deficits in memory and attention. However, people can recover some function over time. Studies examining recovery after motor or language deficits have indicated that undamaged regions of the brain can compensate for the damaged areas. While it is clear that neural plasticity is necessary for functional recovery after damage to the prefrontal cortex, specific mechanisms of cognitive recovery are not as well understood. Para quem está interessado, a Ostifarma, na Amadora, já está a comercializar os Theratogs. 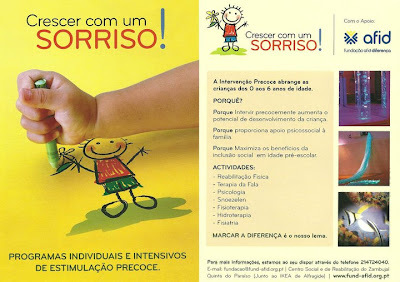 Esta semana demos mais um passo que eu espero que seja um grande passo: o Q. fiz o transplante de células estaminais no XCell Center. Estamos muito optimistas, correu melhor que o previsto porque o Q. conseguiu ter uma quantidade enorme e extraordinária de células. Portanto, o potencial estava lá, estava era no sitio errado :-)E agora está no sitio certo. Torcemos para que o Menino Jesus nos traga resultados e por um ano de 2011 em grande. Avaia looks at people's faces. That's the biggest difference her mother has noticed since the community rallied to send the two-year-old to Germany for special bone marrow stem cell treatment. She had trouble paying attention before. Her eyes would wander constantly. Lights attracted her attention but not her focus. "Since we've been back, she's taking time to look at things, she's focusing a lot better, even on people's faces," Ashley DiMarco said. "If she's interested in it, it could be a toy, a person, anything, she just really takes her time to focus on what it is. She does take her breaks, but she's doing so much better. She is much more alert." Avaia has spastic quadriplegic cerebral palsy. She is unable to walk, talk or communicate, and eats through a feeding tube. Há poucos dias deram-nos mais uma dica, que ao que parece, está a ter bons resultados. Chama-se G Therapy e é na India. Para quem é adepto de terapias ou tratamentos alternativos, como eu, é mais um passo importante uma vez que é baseado na homeopatia.